Recently, a friend of mine shared that his daughter came home from preschool deeply upset because another kid said to her you know brown kids go to jail right? Last week, during an elementary school discussion I was conducting about bullying, one of the children asked, But what if the bully is a grown-up? 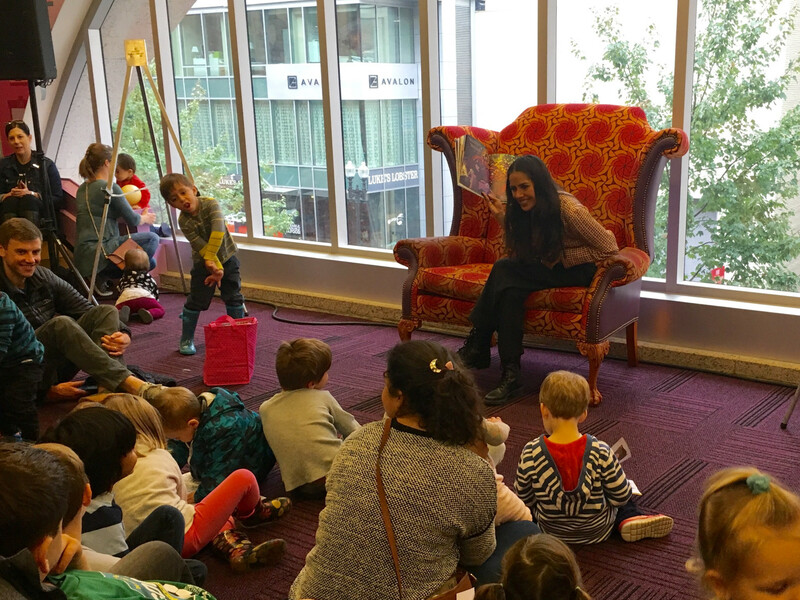 For the past few months, I have been on a U.S. book tour for my childrens book Always Anjali which includes visiting classrooms, presenting at book festivals, and bookstore readings. The kids have been super engaged, curious, and challenging. The child who asked but what if the bully is a grown-up is five. And this child wasnt the only kid who brought this up. The conversation in the classroom stemmed from us discussing the conflict the main character faces in the book. The story is about seven year old Anjali who wants to change her name after she gets teased for being different. When her parents refuse, she takes matters into her own hands. She winds up learning to celebrate who she is and carry her name with pride and power. Its a universal story about appreciating what makes us special and honoring our differences. The students and I were deliberating ways to handle being bullied or what we could do if someone was bullying our friend. After that boy asked the question about the grown-up being a bully, another child softly suggested If its a big problem, its best to not get involved. Let someone else deal with it. Its not our problem. Which then led to other classmates debating if and when we help our friends. A girl privately confessed that her teacher never pronounced her name right. And she was embarrassed to correct her. I wanted to make this articlerequired reading for every educator. In another classroom, when I came to the moment in the book where a kid at Anjalis school purposely says Anjalis name wrong and taunts her, a student starting laughing. Guffawing in fact. I asked him why he thought it was funny. He said Thats a good one. My dad would love it. Four years ago, I found myself consuming as much childrens literature as I could with the hopes of cultivating a worthy library for my baby. In doing so, I found a huge gap in representation and narratives, which ultimately set me on course to write Always Anjali. As someone who has worked with kids my whole life, I was really looking forward to readings. I wanted to have real conversations with our children. I trusted that their hearts are minds were not just ready, but thirsty for more. How do we navigate a new reality where we cant even trust the news and our elected officials to be appropriate viewing for our children? Why are our youngest minds encountering grown-up bullies? Why are we showing our children that their identities arent worthy enough to get right? Why are they conflicted about standing up for someone? Be careful. Our kids are listening to us. To borrow the words of Oprah, what I know for sure is that our kids are smart and they are hearing us. I ever marvel when I hear my exact words come out of the mouths of my kids. When I shared that Dear Abby piece with friends, most were skeptical it came out recently. Dear Abby is doing exactly the opposite of what my book and most would teach. Is this something we are debating now? The fundamental idea that you should proud of who you are and never change to fit in or make someone else more comfortable? Its no wonder our kids are confused. Its horrifying that hate crimes are the worst in a decade. Suicide is now the third leading cause of death among young people. When I wrote Always Anjali, I couldnt have predicted the rhetoric and atmosphere it would be released into. I wrote it because I wanted my kids to see themselves as the heroes in the books they read, navigating the everyday triumphs and heartbreaks of childhood. Thats hard enough. I wanted the Anjali stories to be where children might turn for escape, empowerment, fun, and ultimately, hope. I couldnt have anticipated the questions or imagined the emotions that have been coming up for kids and adults alike when they read the book. From parents telling me their kids are sleeping with the book under their pillow, to finally having their kids open up to them about what they have been dealing with at school, to hearing the personal journeys of those whom have connected to the bookit has been stunning. We have to be so much better. The future is certainly bright. Our kids show us their spirit everyday. The fact that they are even asking these questions demonstrate their want to get it right. Our kids are savvy and thoughtful and mindful. And more socially activated than any generation prior. Its inspiring. I cant stop thinking about a six year old boy who shared I know what its like to feel left out. Anjali felt like she didnt fit in because she couldnt find her name where everyone else could. Thats just terrible but she did stand up for herself in the end. It really shouldnt matter what anyone says to you. She realized that being her own person was cool. Maybe the grown-ups need to be doing the listening. When the boy asked me what if the grown-up was the bully, I insisted, You tell a different grown-up. And if they dont listen, you keep trying. Until you find a grown-up who will listen. But I wish I couldve added what I learned from this wise six year old soul a few days later. I asked her what she does when she feels sad or nervous. She simply said, I do my affirmations. I tell myself that I am loved and I am safe. I am so lucky. And I am so powerful. In honor of National Bullying Prevention Month (October! ), Sheetal Sheth and her publisher, Bharat Babies have teamed up with South Asian Youth Action (SAYA) to bring Always Anjali to underserved children throughout the country. For just $10, you can sponsor a copy of Always Anjali and SAYA will ensure it goes to a child who needs it the most. Anjalis story of resilience and courage can be a catalyst for change, and you can help make that happen. To help, use the code FORLOVE at checkout. After that, the SAYA team will share the book with children who need it the most. With your support, we can help children advocate for themselves and #EndBullying.